Doyon Foundation, with the support of the golfers, sponsors, planning committee, staff and volunteers, held another successful Morris Thompson Memorial Golf Classic June 22 – 23 in Fairbanks, Alaska. In addition to raising money for the Foundation’s Morris Thompson Scholarship Fund, the popular annual event also honored the memory of the late Morris Thompson. The 17th annual event kicked off Thursday, June 22 with a skills tournament warm-up at Chena Bend Golf Course on Fort Wainwright, followed by a reception and Calcutta at Wedgewood Resort. See the skills tournament results on the Foundation website. Aaron Schutt and Marissa Flannery announce the new competitive scholarship for law students at the Calcutta reception. The reception featured two very special moments. The first was when Doyon, Limited President and CEO Aaron Schutt took the stage with his wife, Marissa Flannery, to announce the establishment of an endowment for a new competitive scholarship for aspiring young lawyers. Both graduates of Stanford Law School, the couple partnered with the Doyon, Limited board to help establish the new scholarship fund, making a five-year commitment to getting the scholarship in place. Student speaker Annie Sanford addresses reception guests. Student speaker Annie Sanford of Tok, Alaska, then shared her story, giving the audience a real-life example of how their support makes a difference in the lives of students. “Let’s see if I learned anything from my communications class I took last semester,” Sanford quipped at the start of her speech, drawing encouraging laughter from the filled room. “Normally I don’t volunteer myself to give speeches, but I felt it was important to express how important of a role Doyon Foundation has played in my higher education,” continued Sanford, who is pursuing an associate’s degree at the University of Alaska Fairbanks, and hopes to join the university’s very competitive radiologic technology program in 2018. Her post-graduate plans include staying in Fairbanks to give back to the community that has given her so much. “I feel like Doyon Foundation is a third proud parent in my pursuit of a higher education,” Sanford said. “I want to thank Doyon Foundation and their sponsors for supporting not only me but students across Alaska pursuing our educational dreams.” Read more about Sanford on the Foundation’s blog and see a video of her speech on the Foundation YouTube channel. The evening concluded with a spirited Calcutta, where teams and members of the audience bid on the teams they thought would win the golf tournament the next day. Always a popular event, the Calcutta brought in more than $50,000, which was split between the winning bidders and the Foundation scholarship fund. The festivities continued on Friday, June 23 with the golf tournament, which drew 33 teams of four players each. By early afternoon, the teams had finished the 18 holes at Chena Bend and were celebrating at the golf banquet. First-place team at the 2017 Morris Thompson Memorial Golf Classic. Congratulations to the first-place team comprised of Rick Boyles, Dan Clark, Rob Graves and Scott Jepsen. See the full list of winners on the Foundation website. This year marked the 17th year of the Morris Thompson Memorial Golf Classic. Since inception, the event has enabled the Foundation to award 173 students with Morris Thompson scholarships totaling $370,180. For more information on Doyon Foundation or the Morris Thompson Memorial Golf Classic, visit www.doyonfoundation.com. Language revitalization in the Doyon region took a giant leap forward this week when the Administration for Native Americans (ANA) announced that Doyon Foundation has been selected to receive a Native American Language Preservation and Maintenance grant totaling $900,000 over a three-year period. The 10 ancestral languages of the Doyon region, including nine Athabascan languages plus Inupiaq, represent half of the 20 Native languages in the state of Alaska. All of the Doyon region languages are severely to critically endangered, and will be lost within the span of a few generations if no action is taken. Doyon Foundation, with support from Doyon, Limited, established its language revitalization program in 2009 to support the revitalization of Interior Alaska’s Native languages. “We are humbled and grateful to have been awarded in a highly competitive selection process. This news is very exciting, and this project will be a huge assist to those wanting to teach and learn their ancestral language,” said Allan Hayton, director of the Foundation’s language revitalization program. The grant will help fund the Doyon Languages Online project, a partnership with 7000 Languages, a nonprofit that supports endangered language learning partially through software donated by Transparent Language. The Foundation first partnered with 7000 Languages in 2014 to create and provide learning content for the languages of the Doyon region in an accessible, engaging and proven online environment. During the three-year grant project, a total of 280 introductory online lessons will be created for five of the Doyon languages: Holikachuk, Denaakk’e, Benhti Kenaga’, Hän, and Dinjii Zhuh K’yaa. Ultimately, the Foundation aims to create online courses for all of the Doyon region languages. “We’re thrilled that, after years of hard work, our partners at Doyon Foundation are finally getting the funding they deserve to revitalize their languages. We can’t wait to get started on this project,” said Alexa Little, executive director of 7000 Languages. “We greatly enjoy supporting 7000 Languages, and I’m especially excited to see the Doyon Foundation 7000 Partnership using the Transparent Language technology platform for such a wonderful purpose,” said Michael Quinlan, CEO of Transparent Language, Inc.
ANA, which is an office of the Administration for Children and Families, promotes self-sufficiency and cultural preservation for Native Americans by providing discretionary grant funding for community-based projects, and training and technical assistance to eligible tribes and Native organizations. For more information on ANA and its grant programs, visit www.acf.hhs.gov/ana/grants. For information on Transparent Language and 7000 Languages, visit www.transparent.com/about/7000-languages.html. For more information on Doyon Foundation and the Doyon Languages Online project, visit www.doyonfoundation.com or contact Doris Miller, executive director, at millerd@doyon.com or 907.459.2050. 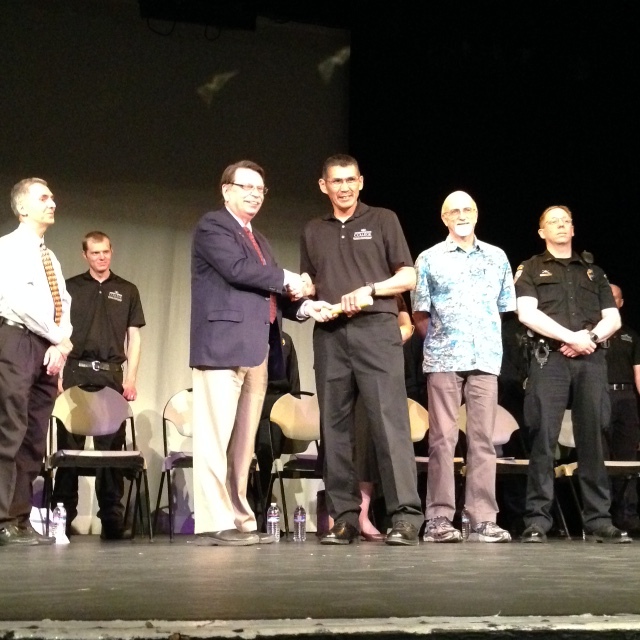 Congratulations to Doyon Foundation student Neal Charlie, of Minto, who graduated from the Law Enforcement Academy at the University of Alaska Fairbanks this spring. Charlie gave the student remarks at the graduation ceremony held May 14 in Fairbanks. Neal Charlie graduating from the Law Enforcement Academy in May. Charlie, the son of the late Neal and Geraldine Charlie, was a recipient of a $6,800 Doyon Foundation Law Enforcement Academy scholarship, generously funded by the Alyeska Pipeline Service Company Alaska Native Program. Charlie also received support from Doyon Universal Services (DUS), which paid the fees for items required in the Law Enforcement Academy application, including criminal history, drug test, driving record history and fingerprints. The 13-week Law Enforcement Academy prepares graduates for careers in law enforcement and security. According to Scott Jones, director of investigations and training at DUS, there are always law enforcement and security positions available in Alaska, especially if the applicant is willing to relocate. “Within Doyon Universal Services, we endeavor to place all successful Alaska Native graduates,” he said. Since graduating, Charlie said he plans to continue his role as a prevention officer with the State of Alaska. He also expects to pursue a position with Doyon Security, a division of DUS, in the near future. To learn more about Doyon Foundation scholarship opportunities, visit www.doyonfoundation.com or contact Maurine McGinty, scholarship program manager, at mcgintym@doyon.com or 907.459.2049. Transparent Language, Inc. and the Doyon Foundation today announced the launch of the Doyon Foundation 7000 Partnership. The goal of the partnership is to create leading-edge software for the teaching and learning of the Athabascan languages of Alaska’s Doyon region, which encompasses approximately 12.5 million acres in Interior Alaska. The Doyon Foundation 7000 Partnership is the latest initiative of Transparent Language’s 7000 Languages Project. With approximately 7,100 living languages in the world today, the goal of the 7000 Languages Project is to create world-class web- and mobile-delivered learning materials for the 7,000 languages beyond the top 100 or so that attract significant commercial support. The technology for the 7000 Languages Project is donated by Transparent Language, but the passion and expertise for each project is brought together by regionally-focused 7000 Partnerships, of which the Doyon Foundation 7000 Partnership is the latest. The 7000 Partnership also responds to a directive from the people and entities of the Doyon region to develop computer-assisted language-learning tools that support the preservation and revitalization of the region’s languages. There are nine Athabascan languages in the Doyon region: Benhti Kenaga’ (Tanana), Deg Xinag, Denaakk’e (Koyukon), Denak’i (Upper Kuskokwim), Dinjii Zhuh K’yaa (Gwich’in), Han, Holikachuk, Tanacross, and Née’ aaneegn’ (Upper Tanana). The Doyon Foundation 7000 Partnership will initially focus on one or two of those and later extend to the remaining languages. Potentially the partnership could evolve to include additional Alaska Native languages. A total of 92 Alaskans donated to Doyon Foundation through the Pick. Click. Give. program in 2014, giving $5,600 of their PFDs to benefit student scholarships. 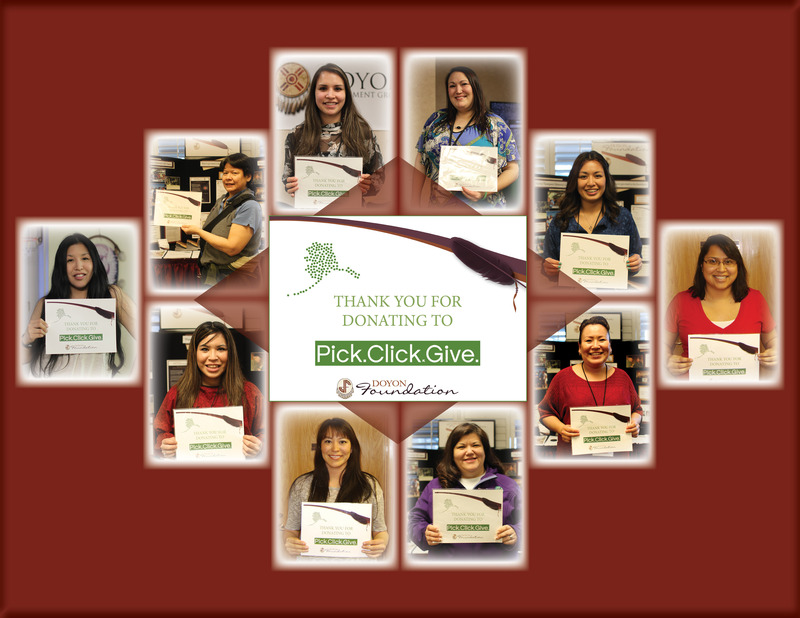 Last year, 73 Alaskans donated a total of $5,900 to Doyon Foundation through Pick. Click. Give. “We are so grateful to the donors who are supporting our students by sharing a portion of their 2014 PFDs,” said Doris Miller, Foundation executive director. Although the 2014 PFD application deadline has passed, Alaskans still have the opportunity to add or change a Pick. Click. Give. donation. Simply visit the PFD website and click on the “Add or Change Your Pick. Click. Give Donation” button on the right-hand side of the page. According to Pick. Click. Give., more Alaskans than ever donated a record amount to Alaska’s nonprofits. A total of $2.77 million was donated (a 13 percent growth over 2013), with an average of $104 per donor (up from $94 in 2013. There were a total of 26,773 donors this year, equaling a 4.8 percent participation rate.